Recorded and produced at Studio Underground in September 2004 by Pelle Saether and Draconian. Mastered at Talor Maid by Peter in de Betou. Musical compositions created by Johan Ericson. Lyrical concept and achievements by Anders Jacobsson & Erik Arvidsson except "Expostulation", written by Ryan Henry. Vocal arrangements by Anders Jacobsson and Johan Ericson. All songs arranged by Johan Ericson and Draconian 2003 - 2004. Coverart and layout by Travis Smith. Miracle under the rain. 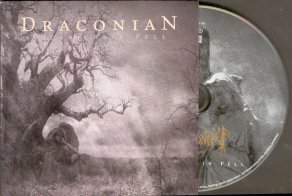 Draconian, the band who created the arrogant, bombastic and moaning album "Where Lovers mourn" , comes back with a well balanced Dark/Goth/Doom metal full of pathos. This is a miracle, isn't it! But it is also the sign that this band is able to learn and has understood that, there was the need to work better and to feel much more inside. Arcane Rain Fell is enough impressive, not very varied, but surely one of the best dark/gothic albums with a funereal yet forceful atmosphere . In this case , the right word is : intense! Draconian have delivered a very gloomy album which is extremely intense and emotional. Landscapes of loss and lamentation soaked with Gothic/Doom sorrow. The equilibrium between Anders' growls and the female voice is optimal, while the music remains mainly essential, though enhanced by a touch of imposing contour. This is to say that all bombastic inutilities have been banned. We have just pain and desolation in foreground. Rainy solitude , rainy passages of piano, bursts of mighty guitar riffs, pitiless and evil grunts, eruption of double bass drumming, slow, doomy , mystic and fearful backgrounds that add a sinister demoniac presence, like happens for example in The Apostasy Canticle. Though Draconian exploit some well known modules of the dark depressive gothic metal (male-female vocals , melancholic melodies alternating with hard guitar riffs and bass drums, touches of piano, desperate loops -just hear Angels' lament-), they propose anyway something of great quality and elegance. And intense indeed. And decently dynamic, in order to escape from boredom or banality. The abhorrent Rays is my favorite track, in this song Draconian meet Rapture, Before the Dawn and Throes of Dawn developing a personal expression. Moreover, in this track, the female vocals get a limited space but they appear absolutely natural without that usual and a bit forced elegiac "look" . This song is the crown of a good done album, which opens with a well impacting A Scenery of Loss. The fans of depressive dark metal, or simply all those who love the anguish story of the fallen angels, cannot miss the suggestive and assertive atmospheres of "Arcane Rain fell" . Assertive because the temperament awakes under the sepulchral desperation, like in Daylight Misery or The Apostasy Canticle) , the blood flows again in anger and passion. The album closes with the very (too) long (15:14) Death come near me, that reminds me of the ambitious empty moaning of the past, but it's also true that Death come near me (originally recorded on the 2002 demo Dark Oceans we cry) has instrumental moments of deep beauty and increasing unstoppable riffing, and intervals more focused on the vocals, far from bombastic sound-scape. All the congratulations spent for "Where Lovers mourn" should be directed actually to "Arcane Rain fell", in spite of the fact that this album is not innovative for sure. But , as told before, this album is empowered by emotions and incredible elegance, it is obscure, supported by a flawless production (the CD was recorded under Pelle Saether's direction ). Played well, sung well with good taste and melancholic strong melodies . Bonjour powerful "tristesse" and romanticism !